During the second week of eating down our cupboards, fridge and freezer we broached more of the stores, made a bigger dent in the fresh food bought to stretch supplies and limited further shopping. There’s a list of the meals we ate, with photos, here. We finally got round to opening more of the tins! The artichoke hearts that had been gathering dust since last summer went into a tuna nicoise salad (along with a tin of tuna) on Day 10, a feta, beetroot and cous cous salad on Day 12 and the frittata on Day 13. We also cracked open some of the tinned fruit, peaches and pineapple. Normally I just go shopping when fresh fruit runs low, so never get round to using up tinned stuff bought for odd recipes and abandoned. I carried on making extra food one day to be used another, whether cooking extra rice one evening to use in rice salad the next day, or turning the extra tomato sauce from Eggs Shakshuka (recipe here) on Day 5 into the basis for sausage casserole on Day 10. The leftover pastry from Day 7 was just big enough to make a one-person quiche for my husband’s packed lunch on Day 10. We ate a bit more of the bigger items bought at the start, stripped down and frozen: the cooking bacon and the big 2kg chicken. Some of the bacon boosted the Day 13 frittata, while I used part of the chicken to make stir fry with noodles for the children on Day 10 and then roast sticky chicken for all on Day 14. The smoked salmon bought from Aldi before the challenge, at £2.75 for 200g, ended up in sandwiches for the children on Day 7, creamy pasta for the children on Day 8, my husband’s packed lunch quiche on Day 10 and a couple of picnic sandwiches on Day 13. I finally got round to using pearl barley to make risotto on Day 9, and made my first ever batch of elderflower cordial (recipe here). Super speedy favourites reappeared (egg, mushrooms and beans with toast; feta and cous cous salad; ham and soft cheese sandwiches; Movie night pizzas), and my family was very keen on the apple pie I made for the first time in years on Day 14. A couple of things bit the dust this week – a mouldy satsuma, and the last of a big pot of strawberry yogurt, bought in the vain hope I could persuade my son away from small pots or yogurt tubes. Otherwise I was pleased to use up leftover stalks and leaves as soup on Days 9 and 14 (recipe here). We made more of a dent in the original top up shopping during the second week. In the first week I bought food for a total of £58.34 for our family of 4 (although it cost me £6 less with the Morrisons voucher). We ate £16.50 of that in the first week, and a further £21 in the second week, leaving just over £20 worth remaining. By the end of the second week, only a few items from my first week’s shopping were still untouched: the harissa paste, and the yellow-stickered trio of a 5p sweetheart cabbage, 40p coconut and £6.38 leg of pork. By avoiding the shops, I limited the new purchases to a single trip to the Co-op and a couple of specific purchases – £1.51 on citric acid to make elderflower cordial, and Fruit Shoots on offer at 16 for £5, as a treat for the children. 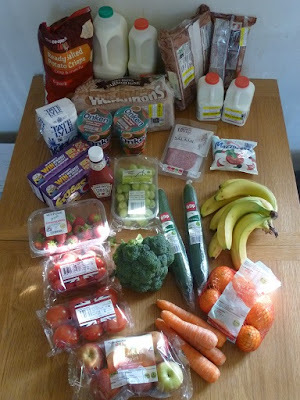 Before heading to the Co-op, I did a rough and ready meal plan taking us into the third week It definitely helped focus my spending on the vouchers I had available. Mainly I bought fresh fruit, veg and milk, plus supplies for the picnic during our day trip to Legoland and items on offer regarded as essential by the children – Onken yogurt at £2 for two 500g pots, 2 packs of frubes for £3 and a 342g bottle of Heinz tomato ketchup for £1. It made me realise that the children drive the few branded products we still buy! I picked up some bread, sandwich thins and hot cross buns in the reduced section, but the yellow-stickered milk I bought was actually charged at full price. Rats. The total came to £30.14, but wth the help of £30 in vouchers I only had to fork out 14p. Vouchers spent on food: £36. Total value: £94.89, of which £39.44 has yet to be eaten. By focusing on using up the food we already had in the house, our food bills for a family of 4 are definitely lower than normal. Over the last fortnight our food shopping has come down to just under £30 a week with the help of vouchers, and would still have been less than £50 a week without the vouchers. Most interestingly for me is that during the fortnight we’ve only eaten about £45 of the food bought – just £22.50 a week. I appreciate we are very fortunate, and many people have to get by on a lot less, but the store cupboard challenge really has made a difference. Anyone else trying to use up their stores, and noticing any changes? I am trying to use up the stores but with fresh food from the polytunnel coming in now it's slow going to see much difference. I was more sneaky than sue and had to mix the ketchup half and half but now they eat any ketchup i buy 🙂 value, branded and in between and because they hadnt noticed they are no longer botbered by any calue things and when i take tbem shopping they look for the cheapest now 🙂 they are 8 and 10 and the eldest is fussy! Aha Sue and K sneaky about the ketchup, I should try that. I did used to put Sainsbury's Basics Breakfast Biscuits in an old Weetabix box, but we've all got used to the square corners now. I tried refilling Fruit Shoot bottles with orange squash, but my daughter noticed the different taste and stopped drinking them. It's funny the brands I've stuck to even when switching so much else to supermarket own brand or value ranges. I've been writing down some basic recipes for cheap baking recently, and it finally forced me to try baking spread instead of Stork, and own brand golden syrup rather than Lyles. Still hanker after the texture of one and the packaging of the other though!